Just to finish this building thread for the turnout, I finally found an old program on my computer to convert my MasterCam drawings into a photo :). 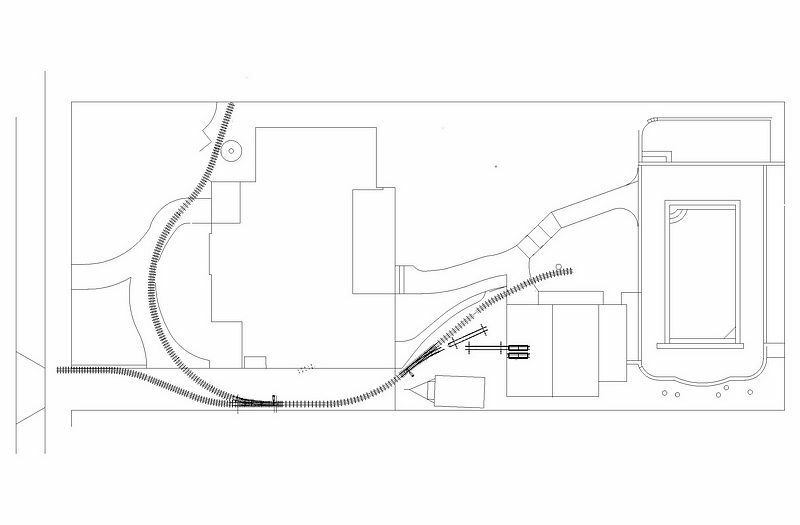 These two drawings below show the present layout of the little "Shortline" using one switch (the one that is completed). This particular mainline is about 185 feet long. Just uses one turnout to load/unload trains onto the track from the storage racks. 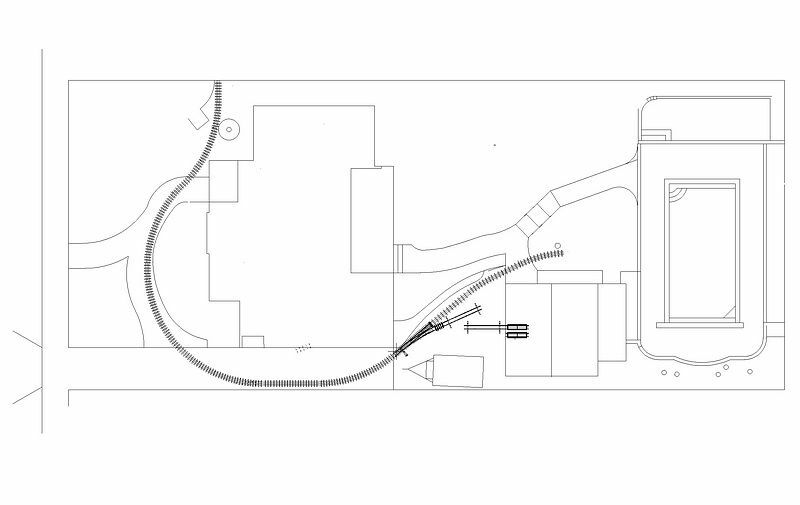 The second drawing shows the siding and station area served by the new turnout kit that was just ordered. With this siding, the ROW should be about 225 feet long with the ability to run two trains bi-directional. OK Gary ... is there a turntable next ? Funny you should mention a "turntable"........just last week I was thinking more and more about how to do an "easy turn" of rolling stock and engines AND do it quickly. I real turntable is out of the question (just not enough property here to do that permanently. So I started to make a 6 foot length of track panel and fasten 4 swivel casters under it. Lightweight and easy to tun. Not very tall (less than eight inches). A couple of wheel stops and just turn the engine or car. I will use rubber tired casters about 4 inches in diameter. That's in the build stage right now. No photos yert until I order more aluminum rail from my distributor. If I had the room, I would make a "wye" using two switches and what's called a "window shield wiper" turntable. The turntable ONLY pivots on one end and moves half the arc. There is a club in Southern California that has one at the end of one section of point to point operation. It's pretty clever and doesn't take a lot of real estate to turn a train. The train stays on the siding and only the engine is turned. The passengers just turn around in their seats to face in the direction of the movement of the train. I did a little "surveying" this morning to see if it was actually feasible to make a complete loop in our yard. It IS possible with a long 135 foot trestle about 34 inches tall on a 20-22 foot radius. Also I would have to install a lift out section for access to the solar water storage tank. Total loop would be a little over 400 feet. There would also have to be a second lift out section for the walkway to the pool. Too many caveats :). Here is the drawing for the complete loop. In the drawing above. you can see the outline of my 6 foot steel gondola (where it says Start of trestle". The solar storage tak is a tight squeeze between a fench and the house. 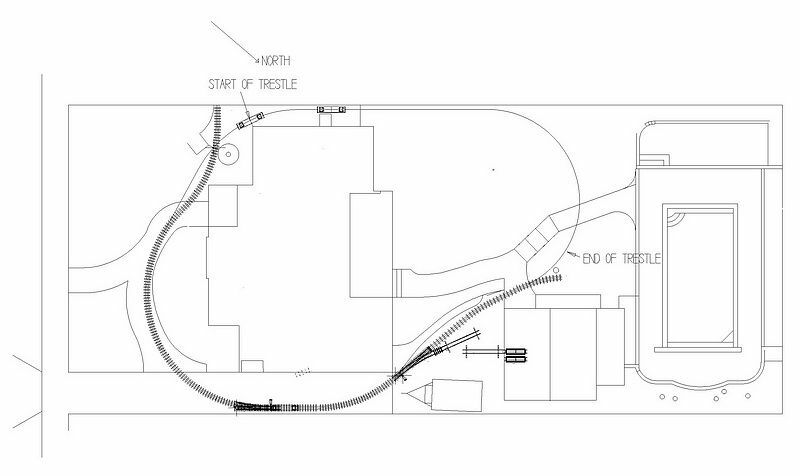 Then the line goes into the backyard and around the small 20-22 ft. radius, across the brick path leading to the pool and deck and then eventually connects to the existing track where it says End of trestle. Derailments of the 350 pound electric locomotives any part of the trestle won't be an issue with the heavy duty re-railing tools I have. A one person operation. I was thinking ^^^^ the "Y" going here @ the driveway ..with a switch were the track meets the grass ..the second up were the sidewalks meets the "Y" ... how small of a radius do you need ? Always wished I could have an outdoor ride on. Just do not think it is the stars. I think I have the room (40acres) but looking at the cost of the equipment - ouch! Intrigued by the 2.5" scale stuff since I like narrow gauge. RMI makes a lot of stuff and some of the Accucraft ride on (Passenger car, plymouth and announced #6 goose) appears to be 2.5" scale. Anyway, just love reading about these kind of adventures. I hear you Ken......my home is already too small at 1600 square feet. AND only two bedroom. I could sell right now for 1M bucks (home is "free and clear"-all equity), but where would I go in So. Cal. to get the land? and a home as large as I have now? Real estate is WAY over-priced in California :)! You definitely have the land for ride-on with 40 acres.....RMI stuff has always been "pricey" even for the ride-on hobby. I know a few folks who have RMI equipment (rolling stock and locomotives) and the guys with the electric stuff are not real happy with the quality. There is a lady at Los Angeles Live Steamers that bought a 3-3/4 inch scale "Sweet Creek" electrified "steam engine" from RMI and had all kinds of issues with it. She is a retired private secretary for Disney Company and pretty feisty. She loaded up the tender with dozens of lemons for one major meet a few years ago and put it on display. Finally she got RMI's attention and they are still working on the electrical issues. The actual RMI steam engines (Sweet Creek's) are great engines....big and hefty and great pullers. The club owns two of these and pull the public on Sundays. Rumor has it that Jay Leno has one of these. He runs now and then at the club in L.A. The Accucraft 2-1/2 inch scale stuff is pretty nice. Their J&S D&RGW coaches are very nice and at $2995, a very fair price. The Goose #6 at $4200 is a great price. Thinking about getting one for the house. I have a Berlyn Goose #6 in 1/20.3. Great brass model. Somebody on LSC has the Accucraft Plymouth engine and runs it in his yard in the S.F. Bay area. Eaton Custom Engineering in Castle Rock, WA used to make the little critter Super Husky. I'm building one now. Only 36 inches long and around 150 pounds. All aluminum frame and body. Easily transported. Battery powered and full sound. He sold this engine in kit form for under $3000. If you do your own machining and build this stuff yourself (easy to do), the cost of this ride-on hobby can be cheaper to do than 1/29th. A lot more fun riding it than watching from afar going around a loop. If I can help you to "get started" in this scale, I can point you to resources and vendors that can make this hobby just as affordable as large scale 1/29th. Let me know. There are many members on MyLargeScale and here on Large Scale Central that have recently "graduated" to the ride-on hobby. "Discover Live Steam". Things for sale, but also a list of clubs through out the Country.